If you love Raffaello treats, then this is a cake for you! Desiccated coconut has much more flavor then regular shredded coconut, and it’s a winning combination with vanilla flavor. Easy to make too. I am thinking to incorporate almonds next time, like maybe add them in between layers or as a topping. Mix egg whites with sugar until stiff, then add coconut, and flour with baking powder. Bake in a 9x13 inch pan for about 20 minutes on 350F, making sure it doesn’t brown too much, it should be just lightly golden. Cool it down slightly, and then evenly pour heated milk over it. Cool completely before putting the cream on. Mix egg yolks with sugar, then add some of the milk, flour, and vanilla sugar. Let remainder of the milk to boil, reduce heat, and then add the egg mixture, stirring constantly for few minutes until it thickens. Transfer into a mixing bowl, and cool completely. When cool, add butter or margarine cut into thin slices, and mix well. Spread over cake, and decorate with either some shredded coconut, or whipped cream. Cut into squares or slices. Chill well before serving. Recipe adapted from “Fat but Happy” magazine, Serbian edition of Macedonian food and wine publication. Lovely once more! Where does one find dessicated coconut? Is it the one in the can? Oh Medena! This looks divine! This looks so delicious. I made it once and it did not turn out good. I'll give it a try this way. For Dragana: I buy dessicated coconut at Whole Foods Market. They have several kinds. Oh my, does this look delicious. I am a huge fan of coconut. I've got to try this! Oh wow ... looks light as a cloud. It's my first time on your site, and I think I'm hooked! Wow, this looks great and I love coconut..How much flour in the cake? I see the flour in the custard, but not the flour in the cake..thanks! This looks like heaven (especially with the blue background and white cloth!). Thank you all for wonderful comments, glad you like it! elenarain - thanks for catching that, it's 100 g flour. I will give it a try..looks lovely! The combination of light egg white based cake with a rich cream sounds wonderful! 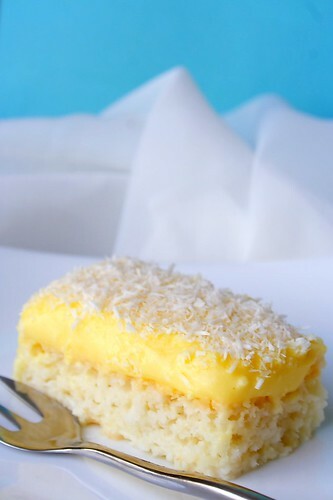 I'd love to try this with coconut milk instead of the regular in the custard. Mnogo mi se vise dopadaju rafaelo stangle od kuglica,zato sto su kremaste. Hi, i found out your blog surfing on flickr. I liked and I decided to give you a little award that you can take on my blog. I'm Elena and I'm sorry for my bad english!!! Hola Medena, nice to meet you and your wonderful blog. Have seen your pictures at Flickr... so beautiful. Will follow your recipes. My best wishes. That looks nice and light and moist and good! Yum! Looks light and delicious! I made this cake yesterday for my guest. It was a hit! Teh only thing is that I found the cake too moist so I will use less milk to moisten it next time. My cream curdle:( I don't know why. But it tasted great anyway. Thanks for the recipe! I did it and loved it. Unfortunately the custard was a bit liquid. I will do it again with less milk (maybe 3 cups instead of 4). Hello, i did it, and it is lovely!